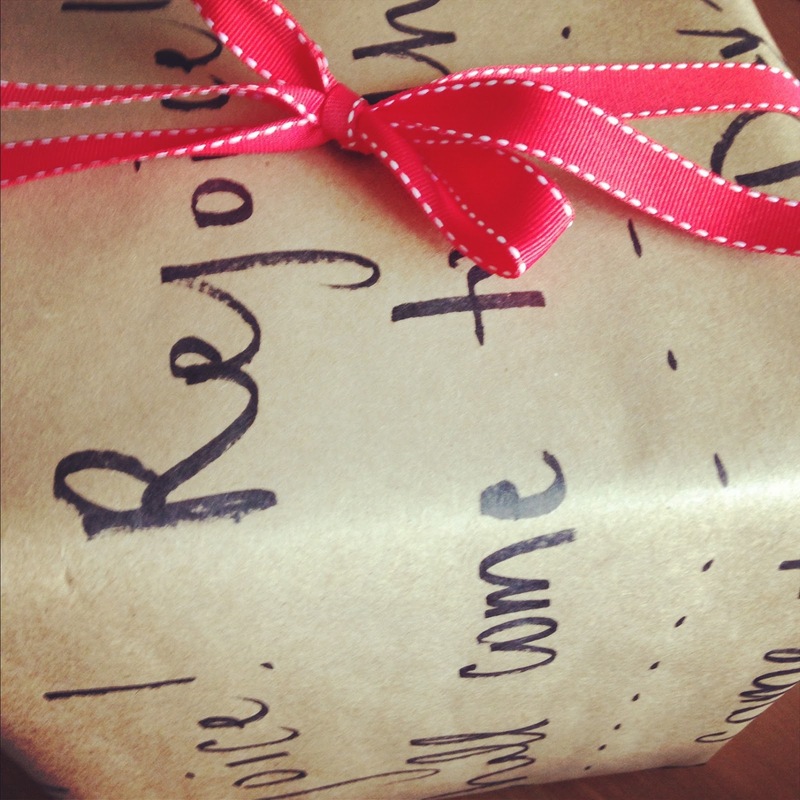 Around the holidays, this is especially a struggle, most specifically in the form of gift-wrap. You see, when I find the most gorgeous woodgrain wrapping paper at The Container Store or actually splurge on Rifle Paper Co. Wrapping sheets ((assuming that it will be a generous roll...it only comes with 3 tiny sheets, by the way. someone didn't read the description. )), it sort of gives me heart palpitations when I think that someone will simply rip it off to find the Christmas loot inside. This year, I went with kraft paper. I've done this off & on for Christmases past, but not exclusively. This year? It's exclusive, y'all. Here are a few ways you can make it more unique and less...um...well, plain jane and more festive with just a few simple additions that you likely already have on hand. 1. 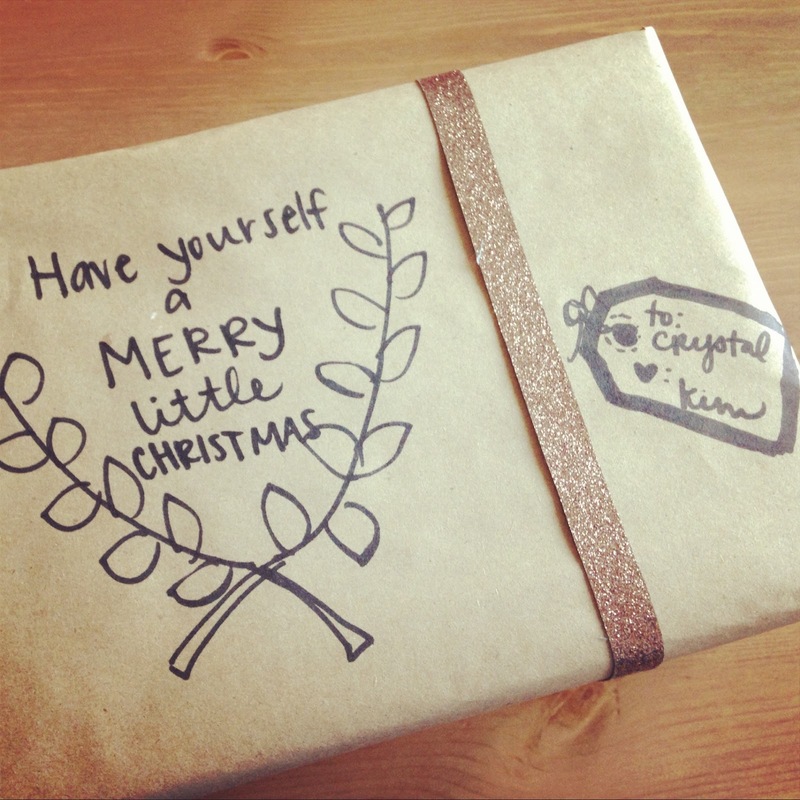 A sweet little message + glitter ribbon. Simply wrap it up and draw a little somethin' somethin'. Get as intricate as you wish. Measure out how much you need to wrap a specific box. 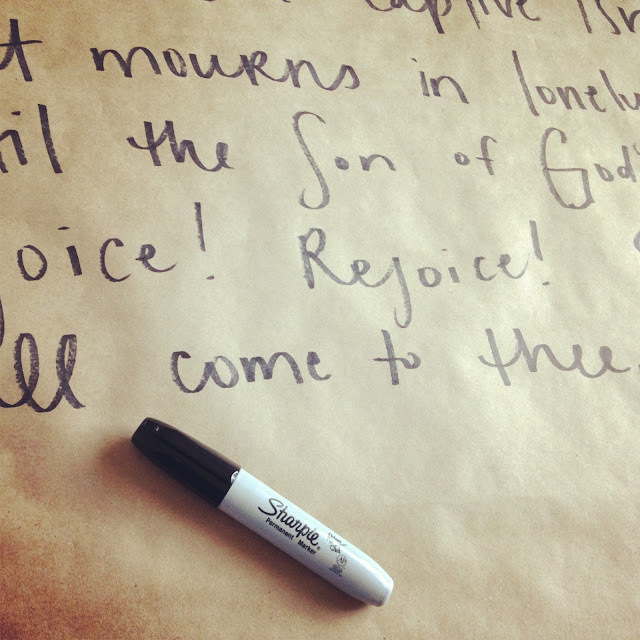 Spread paper out on a table and anchor it down on the corners. Choose the gift recipient's favorite Christmas song ((this is for Chase, so I chose "O Come O Come, Emmanuel," which he preached on yesterday)) and write out the lyrics. 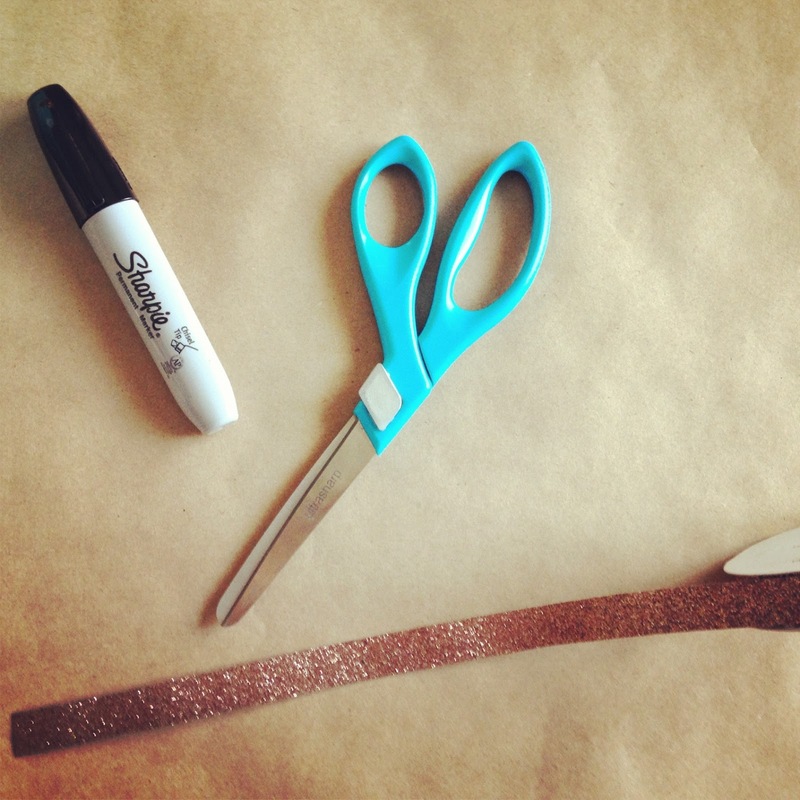 Wrap gift and then add a ribbon for some color. 3. Potato or Apple Stamp It. 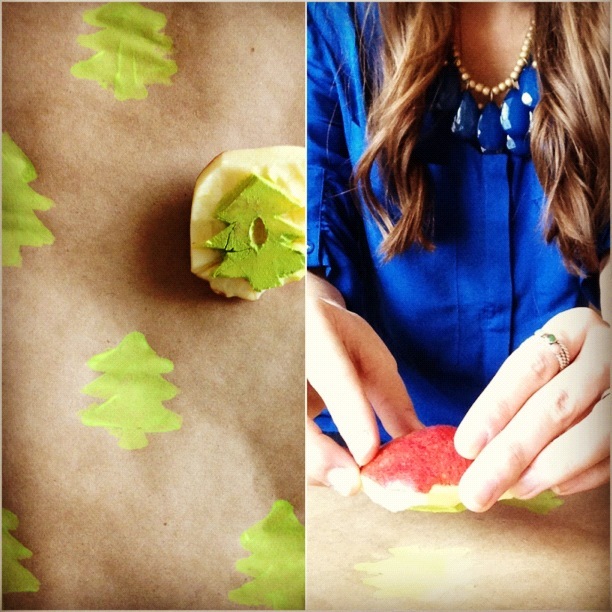 Carve out a shape into a potato or apple ((tutorial here)) and using regular craft paint, stamp onto paper and fill in any inconsistencies with a q-tip or paintbrush. Now your gifts are personalized, pretty, didn't cost an arm & a leg to wrap and don't look like everyone else's under the tree! :D Yippee! 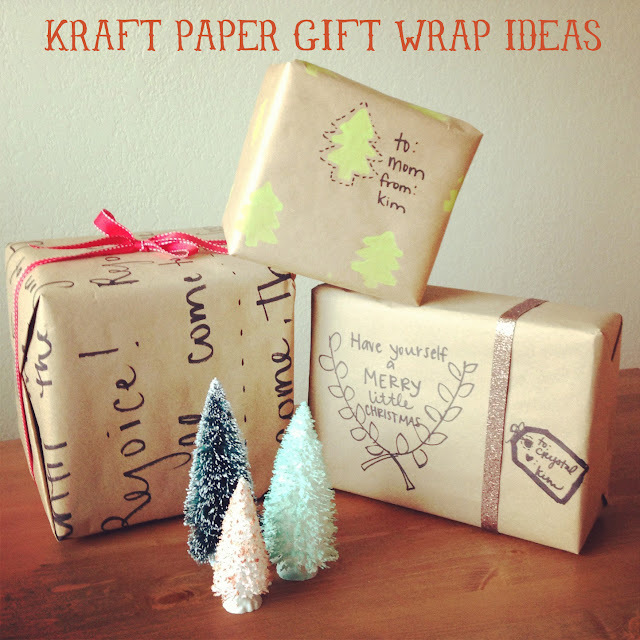 -When using Kraft paper to wrap gifts, typical scotch tape doesn't work. I use packaging tape and it seems to work best (it's still clear). -If you want to stamp a lot of paper at a time, cut it out and, using thumb tacks, attach it to walls. Stamp away, let it dry, and then wrap. -Metallic paint pens would also be gorgeous instead of sharpies! I just like the simple look of these guys with a pop of color for the ribbon or paint. -Go to Joann, back in the picture frame section. Get a roll of "frame backing paper" instead of standard kraft paper. It's a bit thinner and easier to work with. Use a coupon and get the roll for less than $3. Run a victory lap. Grab some cute ribbon on that victory lap and get in line. It's the holidays, so you'll be there for a while. 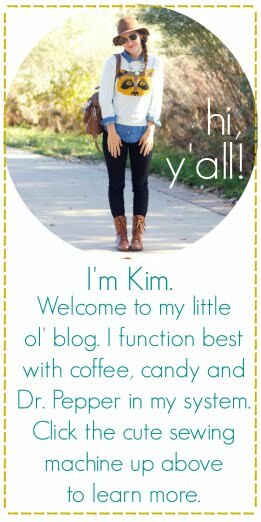 i haven't caught up on your blog, in what feels like YEARS!!!! And I finally sat down tonight, and did! you always deliver kim! This is a great idea and definitely unique over the traditional wrap! But I LOVE the lyric idea!! I have a few more gifts to wrap and I think one of them is going to have some lyrics on it!! :) PS I LOVELOVELOVE your hand writing!!! I really like this classic brown wrapping paper! I can't find it anywhere though! But I'll keep looking!!! I spent an amount I'm embarrassed to even type on ribbon this year. Must not get sucked in next year! Also, I get my kraft paper at the Dollar Store! I do the same thing but I have the kids decorate the paper. It's a fun project for the kids and it makes each gift very unique! And FYI the dollar store carries 3M brown packing paper in decent size rolls for well... $1! My one year old was trying to tear it and couldn't so its good and thick. I love the craze of craft paper this year! It's so wonderful because it can be personalized! I like the stamps, but the handwriting is my absolute favorite! so cute! paper bags and sharpies is genius. Attractive publishing on ohsweetjoy.com.It is a power full site for us.Now a days it site has become vary popular & demanded site for all of us.So I like it. I think not new because there are a lot of individuals have already publish it or study it, but its okay. Please observe this , in your publish there are few terms that you not modify with properly after you used Search engines convert for convert it from your mom terminology into British.As I want to share Is a wood made cards holder better than others? People select them for their function, versatility and elegance. Wood business cards holders for cards or credit cards can carry all of these qualities so it's not surprising why people select them to give as a gift to family, colleagues and friends. So pretty! 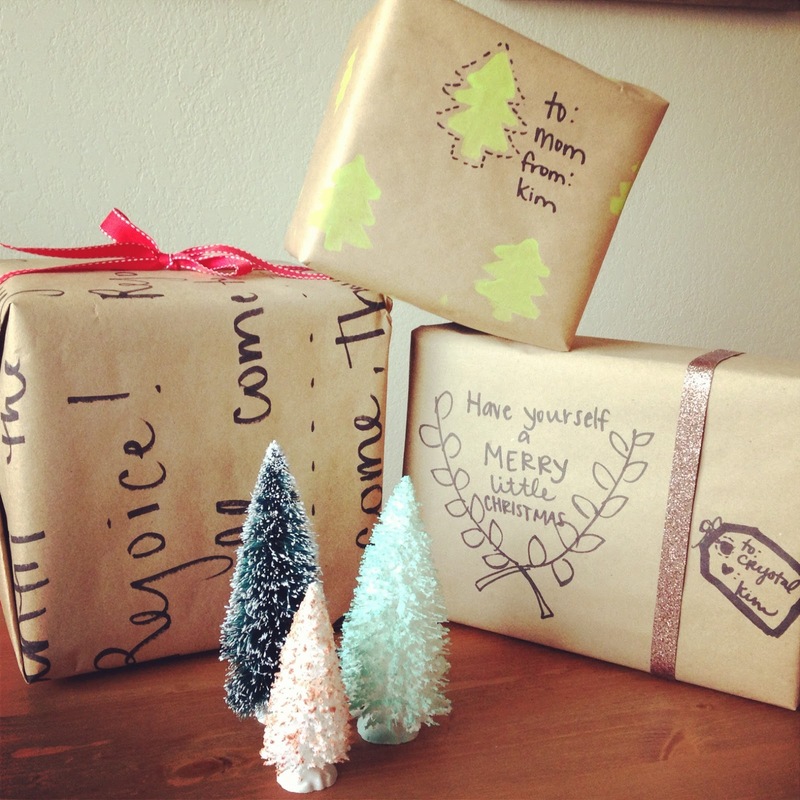 I love homemade wrapping paper!